Have you ever wonder how a lamp that is used to light up the stairs of a building is connected to the two switches that controls it from either end? These two way switches have a single pole double throw (SPDT) configuration. 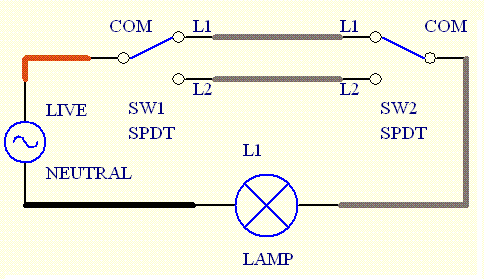 Each has a common terminal (COM) with a pole that can be switched between position L1 or L2. 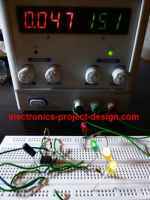 The two way light switch wiring can be implemented by using 2 different methods. Both of the methods used are described below. 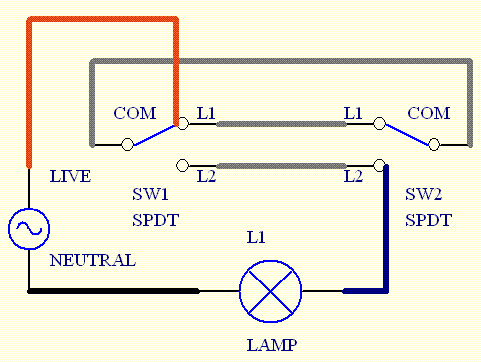 The first method as shown in the figure above have the COM, L1 and L2 of both the SPDT switches connected together. For incandescent lamp, the recommended wire gauge used is AWG #14. The LIVE AC Source is connected to L1 of SW1 and one side of the load is connected to L2 of SW2. The other side of the load is then connected to NEUTRAL of the AC Source. With this configuration, the lamp will be turned ON when one switch is at ON position and the other is at OFF position. If both switches are in the same position, the lamp will be OFF. The other method is as shown in the figure above. In this configuration, the L1 of both SW1 and SW2 are connected together. Similarly, the L2 of both SW1 and SW2 are connected together. The LIVE of the AC Source is connected to COM of SW1 and one side of the load is connected to COM of SW2. The other side of the load is then connected to the NEUTRAL of the AC Source. With this configuration, the lamp will be turned ON when one switch is ON and the other is also ON. If both switches are in different position, the lamp will be OFF. Take note that as the installation involves mains power supply, only those who are qualified and have electrical wiring knowledge should do this wiring. When doing the wiring, it is recommended that the power supply is disconnected from the load and the switches.